Want to get away from the crowds and experience a new way to access the great outdoors? 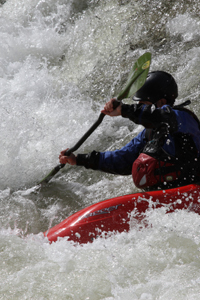 Feel restricted on land or have an urge to get wet, then why not try canoeing or kayaking? We cater for the complete novice and equally welcome those with prior experience. Our members might enjoy the exhilaration of white water, surf or tide race paddling, have fun playboating or perhaps take a more relaxed approach, having chance wildlife encounters on a picturesque river or coastal sea trip. These are both organised formal trips or with like-minded people just getting together to go boating.Playboating and surfing tend to happen in specific places where the water conditions are just right. One of the best places for playboating near Bristol is the Cardiff White Water Centre where we often practise during the summer when the white water levels are low. Whatever your tastes, AOAC can help you meet your paddlesport aspirations. During the summer months we run ‘Taster’ sessions and a programme of British Canoeing qualification courses that can help you achieve the standard needed to take part in some of our more adventurous trips.